Are you still waiting to find out who is behind door number two on our Japanese tips tour? Wait no more! Please welcome my friend Bethany from Wanderlust for Less. 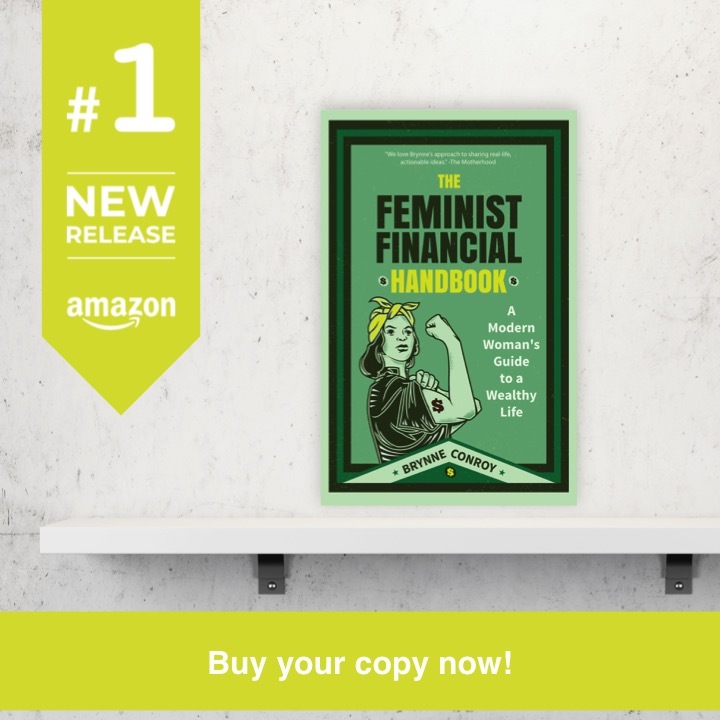 She has some amazing tips–many of which never would have occurred to me before I left! Read on for some veteran travel tips. Japan is a truly incredible place to visit. My husband, Travis, and I visited friends who lived there 2 years ago, and we were struck by the proud history and majesty of this beautiful culture. One of the things that really struck me about Japan is the low crime rate and the honesty the people showed. Let me give you an example. 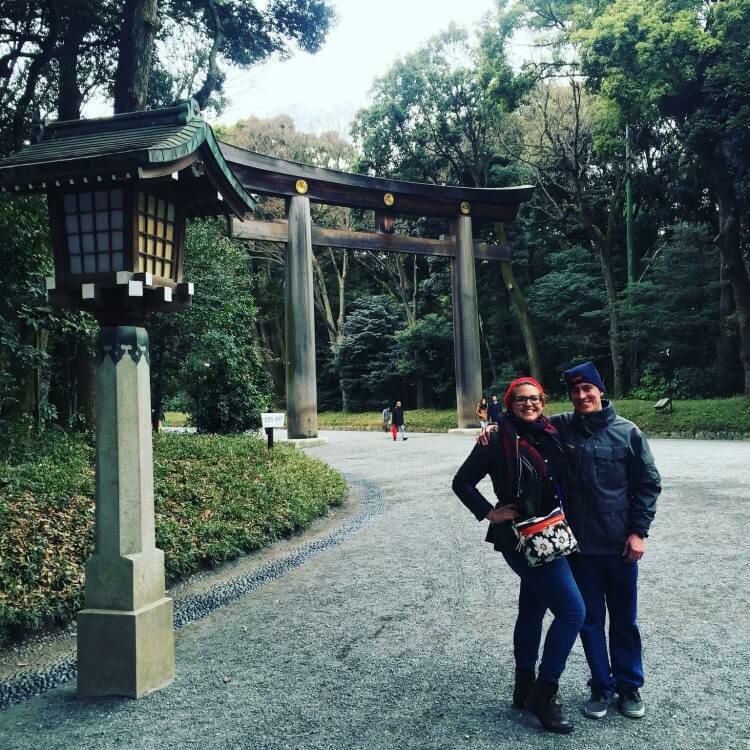 Travis and I were recently engaged when we traveled from LA to Tokyo. We had an 18 hour layover in Beijing and took advantage of seeing a tiny bit of the city (fun fact—you can visit China without a visa if you are there less than 72 hours). As a part of our wedding, we were going to have an ‘International Chocolate Bar’—aka one of those cutesy countertops filled with an assortment of candies that your relatives will blow through like a tornado, stuffing their tiny brown, monogramed ‘candy’ bags. Except, our wedding was travel themed, so we tried to put a little spin on it by gathering sweets from as many countries as we could muster. Whilst in China, we found these adorable little panda bear chocolates with unique flavors and bought 3 boxes. We also got a little stuffed panda for our niece, and they put it in a big bag that had a panda decoration on the side. 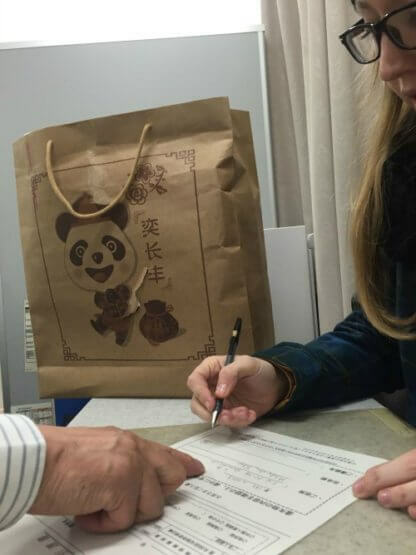 The plan was simple—we were going to carry that little Panda accented bag with us through the Beijing airport, on the plane ride to Tokyo, next to us on the Narita Express train from the airport to Shinjuku, then aboard the Chuo line toward Nakano to Mitaka station. What could possibly go wrong? 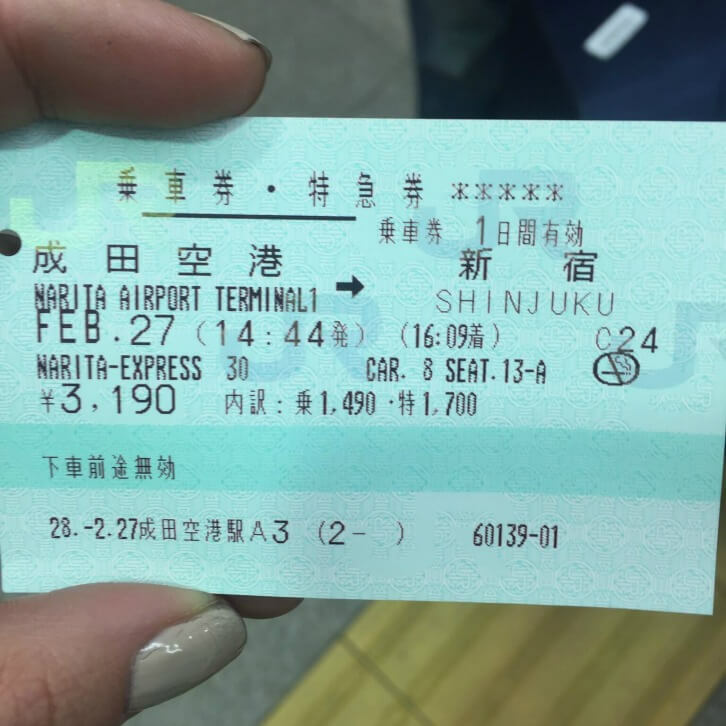 On the transfer from the Narita Express to the Chuo line… we left the bag. On the train. As soon as we realized what happened, my heart sank. But there seemed to be a glimmer of hope. My friend, Tori, who had lived in Tokyo about a year, said there was a chance we could track it down. The crime rate in Japan is virtually nonexistent. Missing items on trains are routinely turned in and were able to be tracked down. We just needed to find the right phone numbers, and people who spoke Japanese. Before you travel to Japan, make sure you download this free wifi app (it can’t be downloaded once you are in Japan!) It allows you to connect to several local WiFis for free once you are there. Asakusa (Senso-ji temple), Kappabashi (this is also known as the kitchen district, so if you want a Japanese knife, buy it here! I got a few good ones from a knife shop to give my brothers as birthday gifts), Ueno Park, and the Yanaka neighborhoods are also fun to walk around because there are a lot of cool old buildings—this area was not destroyed in the war. Akihabara is a crazy electronics neighborhood – this is where all the “manga” stuff is, (Japanese comics). I will warn you—it’s a weird place, but worth a walk through. If you are into owls – they even have an owl cafe. Weird, weird, weird, but also, awesome. Roppongi is a great place to go if you are looking for a lot of amazing restaurants, bars, clubs, etc. There are many foreigners here and English is spoken everywhere. Check out Roppongi Hills (there’s an amazing view from the observation floor) and Tokyo Midtown. Shibuya is one of my favorite neighborhoods. Some must sees in the area: Hachiko statue in the Shibuya station, Shibuya crossing (AKA the busiest crosswalk in the world—go into the Starbucks on the second floor of the bookstore and sit at the counter for an awesome perspective of the crossing! ), Yoyogi Park with the Meiji shrine, Takeshita street (outside Harajuku station), Kiddyland, and the Oriental Bazaar—more on those later. Omotesando Dori is a great street to walk down, there are fun alleyways if you turn in by the Ralph Lauren store. You should check out Omotesando hills on the north side of the street, it has a fancy shopping mall and cool architecture. In the same area is also a great shop called Oriental Bazaar. It is a red building that looks kind of like a temple. Definitely stock up on your souvenirs here. There are some tax-free options you might have to declare at the airport (if that worries you, it’s really simple—you put the receipt in a little box in the airport and move along). I bought my bridesmaids Japanese robes for a really great price here, as well as some gorgeous pottery. They were a huge hit! If you go down the side street (kind of an alleyway) right near KiddyLand, closer to the Harajuku side, (it’s called Kat Street – or Kyu-shibuyagawa promenade), then you can walk all the way down to Shibuya and do some shopping. There are some good guy stores down that way, like the Freak Store (yes, really). While you’re in the Harajuku area, check out Yoyogi park (on the west side of Harajuku station), from the station, walk out to the right and follow the sidewalk to the first right turn you can make. It’s a huge park and has lots of fun stuff going on, including a major tourist attraction: Meiji shrine. This will take you a half or whole day (at least) to do all of this little tour, depending on how fast you walk. I recommend you check out a map and break it down by area. If you only have a couple of hours a day, do one day at Harajuku station, one day at Omotesando station, one day at Shibuya station. Definitely try to check out Yoyogi park on the weekend! So, as we know, food is one of the best things to eat abroad! And yes, ramen and sushi are the most delicious things ever—especially in Japan! 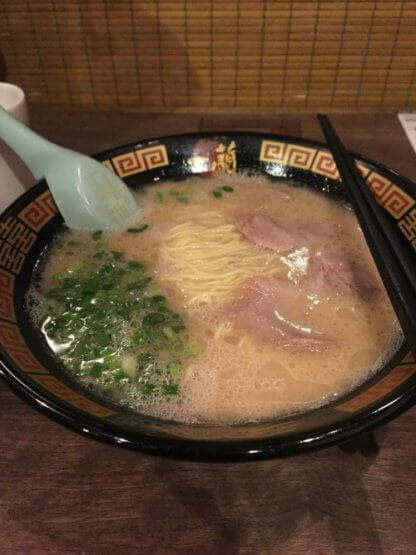 My favorite Ramen place is Ichiran in Shibuya. You can order your ramen from your personal little cubby where the chef delivers your ramen through a curtain. If you leave some broth in the bottom of the bowl, you can order some more noodles and meat to add to it. It is magical and delicious. Though there are a lot of incredible sushi places around the city, Genki Sushi Co. is a conveyor belt sushi bar. You order your sushi on a little screen in front of you and it is delivered to your seat on a mini train. That was one train we wouldn’t miss! I, for one, was thoroughly amused. If you like donuts, I highly recommend Mister Donut. They also have great coffee (with free refills!). Also, there are some vending machines with an assortment of delicious beverages—both hot AND cold—you can get in the train stations or on the street. Another quick and important tip: there are no paper towels in the restrooms, so people walk around with little towels. They also don’t have trashcans, but the city is incredibly clean. People carry their garbage around with them until they can throw it away. There are usually bins on the platforms in the train stations. Happy travels, friends and さよなら—Sayonara! 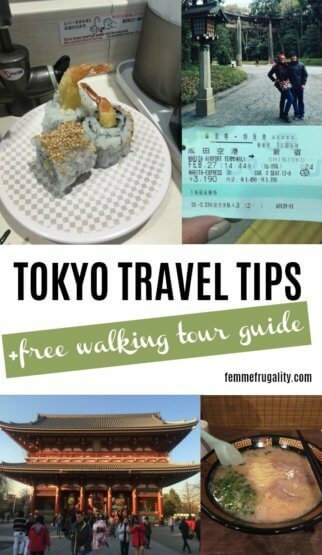 This entry was posted in travel on March 28, 2018 by femmefrugality. Japan’s the best! And sorry again for not being able to chip in on this post! Loved all the yummy and surprisingly cheap eats, too. Conveyor belt sushi was amazing as was Ichiran. You’re planning another trip there, right? Wonderful post! I love the free walking tours – in most cases they can be a great way to explore the city.